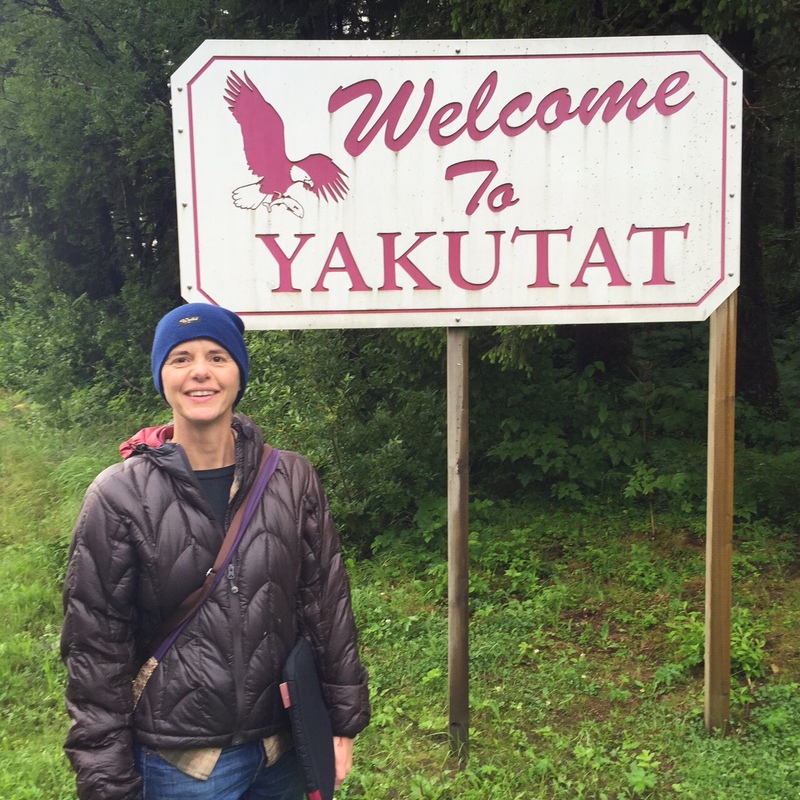 We arrived at Yakutat around 6:30 Wednesday morning. Docking the Kennicott was a feat of great precision. It seemed like all of us who were awake were out on the deck, leaning over the starboard railing, wondering how they were going to pull it off. First, a small skiff left the dock and waited for heavy green ropes to be passed down to it. The dockworkers then tied these ropes to pilings in back and in front of the dock. A bald eagle sitting on the rear piling took flight reluctantly. It had looked entirely content there, hanging out with a couple of gulls. After the ropes were secured, the ferry began to nudge sidelong toward the dock. Eventually, a rickety walkway was lowered for the walk-off passengers and a monstrous bay door rolled open to deliver the vehicles. 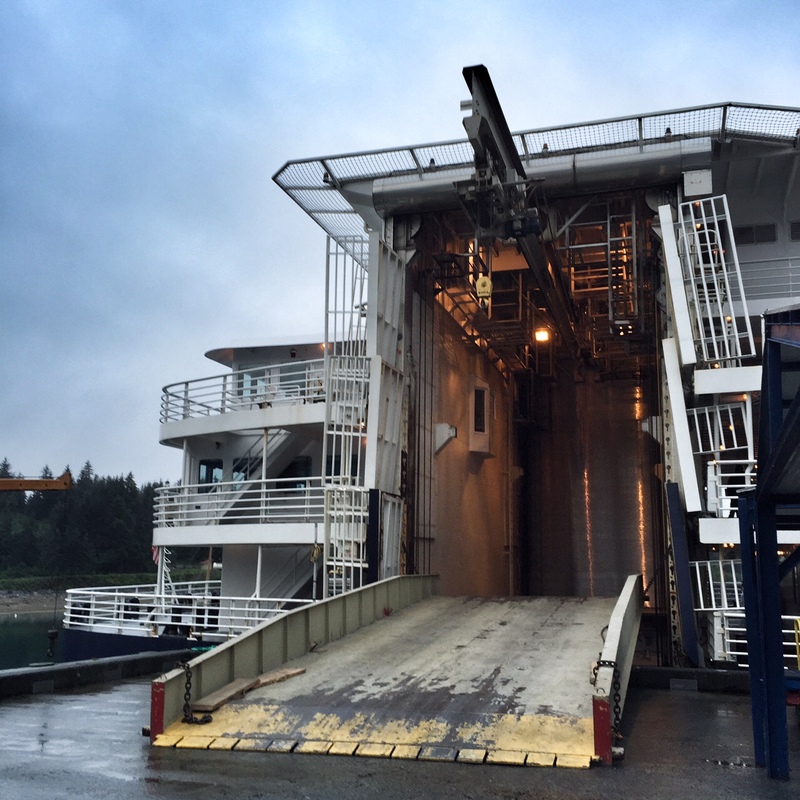 Because the Yakutat dock is much higher than the car deck, they used an elevator to raise each vehicle to the level of the ramp. 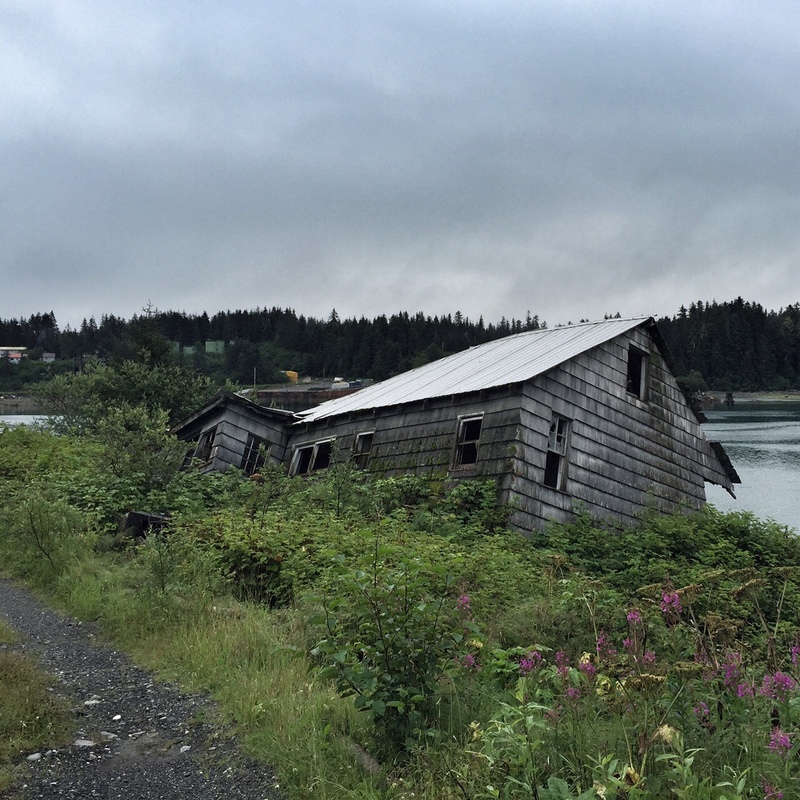 What I loved most about Yakutat was the quiet. (The ferry is full of noises, day and night.) 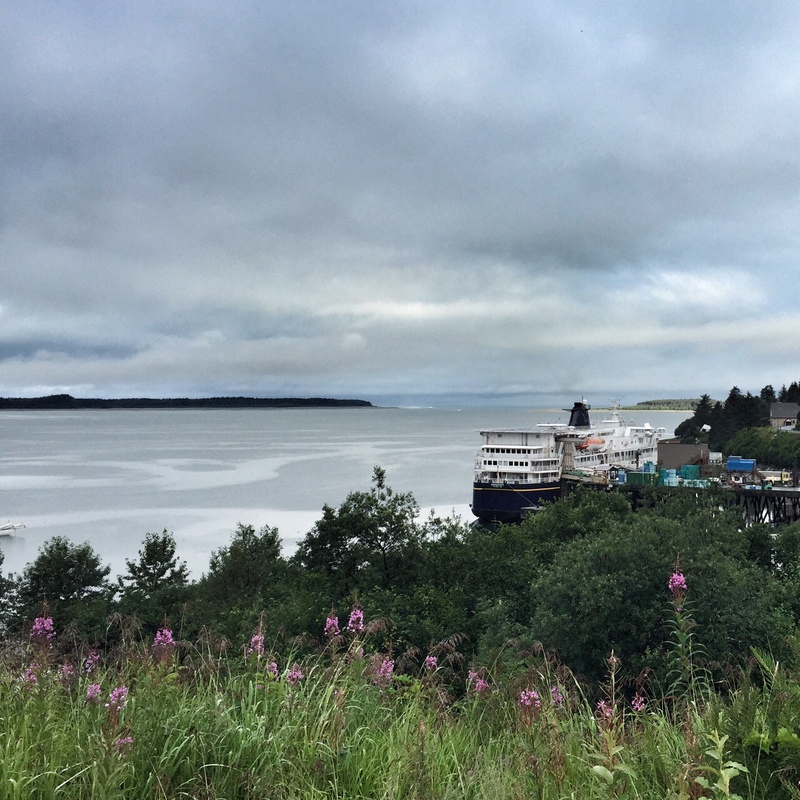 The village is fully enveloped by part of the Tongass National Forest*. Beyond that, the imposing Wrangell-St. Elias mountains launch themselves skyward. You can’t drive in or out — people get there by plane or by boat. 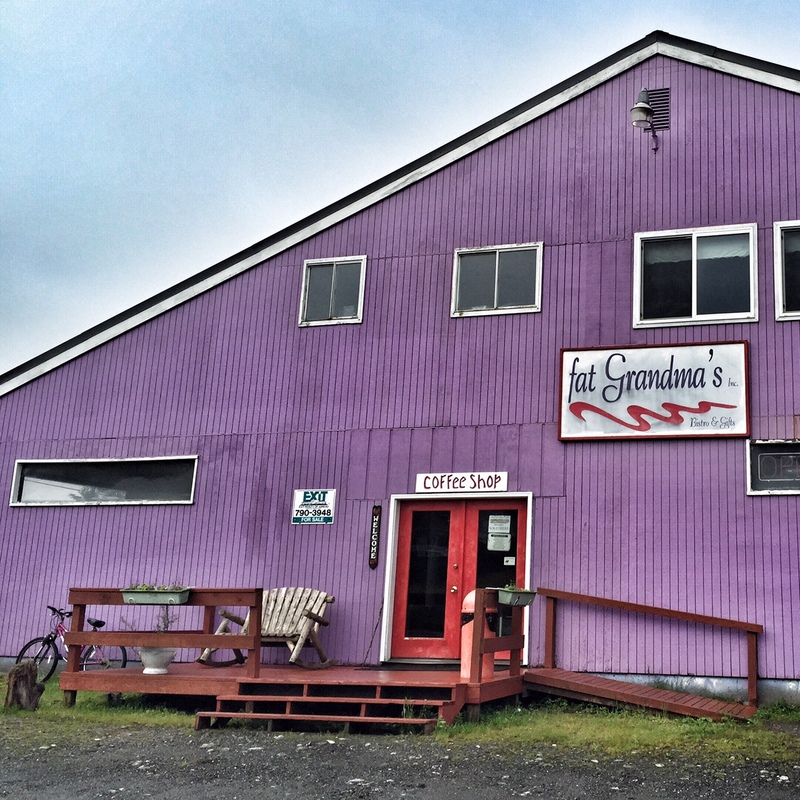 Yakutat has three small general stores, four churches, and not a whole lot else. 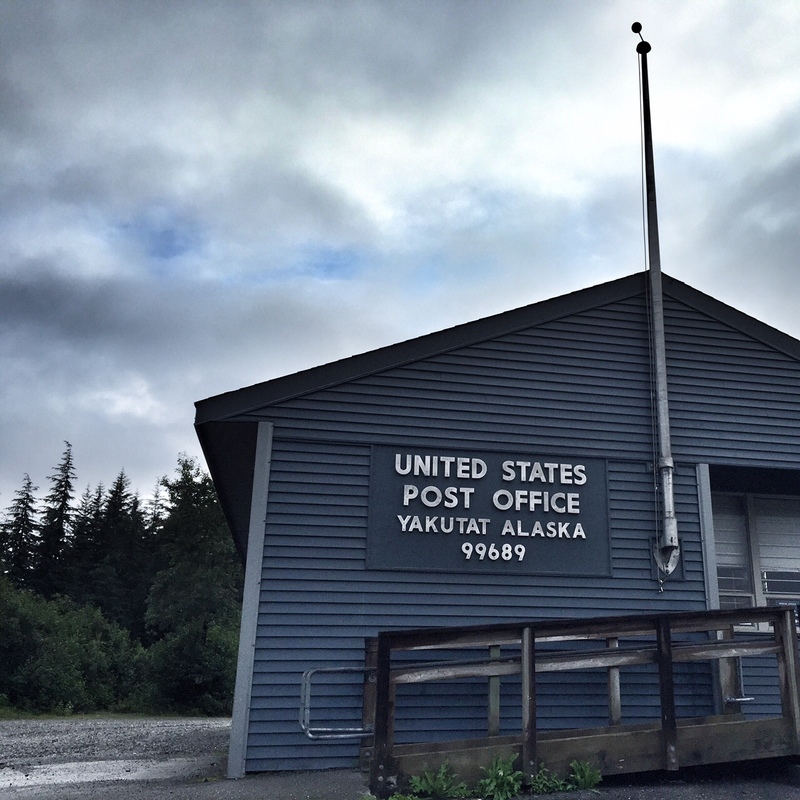 We saw a medical center, a U.S. Forest Service office, a courthouse building that’s about the size of a shipping container, and a post office. If you have ATT you can get a sliver of cell phone reception, but everyone else is out of luck. There’s no free wifi in town, either, except maybe in the bar which, reasonably, is closed at 7 a.m.
We still had an hour to sort ourselves out but it’s unsettling when you know all your stuff is on a boat and you don’t know where you are except that you’re not near or on that boat. Our Verizon phones were useless, but who wants to live in a world where you’re helpless without an iPhone, anyway? I flagged down the next passing pickup truck and the driver laughed at us — yep, you’re walking away from the boat — then he drove us back to the dock. Kindness and generosity continue to be the mainstays of this journey. This house is on the verge of falling into the bay. There are still pictures hanging on the walls inside. Back on the boat and headed for Whittier, I was feeling claustrophobic and I still wanted to walk. On the days Eddie Tobacco was onboard, we walked around the deck for a full hour. Left on my own, I mustered for only 30 minutes. The weather was better than it had been but the boat still swayed in the open waters of the Gulf, and there was water all over the decks from Tuesday’s rough weather. Instead of going for a walk it was more like, “I’m going to go outside and try not to fall down for 30 minutes.” Think of walking on one of those moving sidewalks at the airport, except the sidewalk is slippery with rainwater, it rolls up and down unpredictably, and there are whales. *The Tongass just got some good news. On July 29, the 9th U.S. Circuit Court of Appeals declared that logging companies are still required to keep roads out of the roadless part of the forest. The Alaska Dispatch has the story. You’re amazing Shae, the beautiful photos, the clear visuals in your writing. I’ve never followed a travel blog before, and I suspect I’ve started at the very high end of what’s out there. I’m honored to be ‘aboard’ with you. Laura, thank you for these kind words. I’m grateful you’re along for this ride. I didn’t intend to start a travel blog — just to write some things about some places — but I guess that’s what a travel blog is!